For Why the sky above belongs to everyone, and the earth below doesn’t? 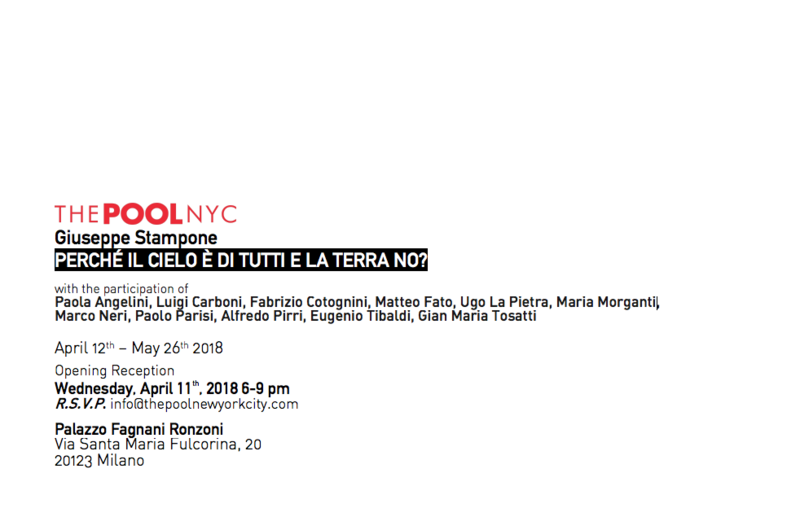 Giuseppe Stampone asked Paola Angelini, Luigi Carboni, Fabrizio Cotognini, Matteo Fato, Ugo La Pietra, Maria Morganti, Marco Neri, Paolo Parisi, Alfredo Pirri, Eugenio Tibaldi, Gian Maria Tosatti, giving spatial coordinates (30×40 cm), to create a possible sky. Lives and works between Bruxelles and Rome. Giuseppe Stampone alternates drawings made with BIC ballpoint pen and multimedia installations. His art is a form of political protest and invites the public to reflect on fundamental issues such as immigration, water shortage and war. He established solstizio.org, co-funded by the European Union and developed in various countries, based on artistic interventions in which the new generations deal with global contemporary issues such as environment, social conflicts and sustainable economies. In Solstizio Stampone realized several installations in public spaces with the participation of 30,000 citizens of ten different nations. He collaborates with a number of universities such as the Academy of Fine Arts in Urbino, IULM in Milan, the Federico II University of Naples and the McLuhan Program in Culture and Technology in Toronto. From 2017 he is an Affiliated Fellow of the Civitella Ranieri Foundation of New York and from 2013 of the American Academy of Rome. His work has been exhibited in several Biennials, museums and international foundations including: Architecture Biennial of Seoul, South Korea (2017); Triennale of Ostend, Belgium (2017); 56th International Art Biennale of Venice, Cuban National Pavilion (2015); Biennale of Kochi-Muziris, Kerala, India (2012); 11th Biennial of Havana, Cuba (2012); Liverpool Biennial, UK (2010); 14th and 15th Rome Quadrennial (2004-2008); Fuori Uso, Pescara; Kunsthalle Museum of Art in Gwangju, South Korea; BASE, Florence; Wilfredo Lam Contemporary Art Center in Havana, Cuba; MAXXI, Rome; MACRO, Rome; Sandretto Re Rebaudengo Foundation, Turin; Triennale Bovisa, Milan; The Invisible Dog Art Center, Brooklyn, NYC. Giuseppe Stampone’s solo exhibitions in museums include: CIAC, Foligno (2018); GAMeC, Bergamo (2014), National Institute for Graphics, Rome (2015), Palazzo Reale, Milan (2014).